Morning after breakfast and drive to Agra. Arrive Agra and check-in at hotel. 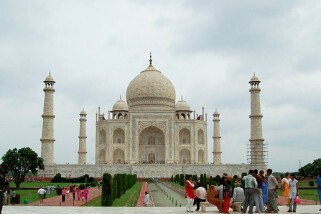 Later visit the world famous Taj Mahal, Built by the Mughal Emperor Shahjahan in 1630 for his queen Mumtaz Mahal to enshrine her mortal remains. Also visit Agra Fort, containing the pearl mosque – the rusty and majestic red sandstone fort of Agra stands on the bank of river Yamuna and Emperor Akbar started the construction in 1566. At the Diwan-I-Khas (Hall of Private Audience) where marble pavilions with floral inlays lend on ethereal ambience, the Emperor sat on his gem-studded peacock throne and met foreign ambassador and rulers of friendly kingdoms. Night stay in Agra. Morning after breakfast and drive to Jaipur en-route visit Fatehpur Sikri , a perfectly preserved red sandstone “ghost town” which was the estranged capital of mughal emperor Akbar, built in 1569 and deserted when its water supply failed. Arrive Jaipur and check-in at hotel. Night stay in Jaipur. Morning after breakfast and drive to Pushkar. Arrive Pushkar and check-in at the hotel. Later proceed for city sightseeing tour of Pushkar. Pushkar boasts temples, though few are as ancient as you might expect at such an important pilgrimage site, since many were deserted by Aurangzeb and subsequently rebuilt. The most famous is the Brahma Temple, said to be one of the few temples in the world dedicated to this deity. It's marked by red spire, and over the entrance gateway is the hans, or goose symbol, of Brahma, who is said to have personally chosen Pushkar as its site en-route visit AJMER - visit the famous Dargah of Sufi Saint Hazrat Khwaja Moinuddin Hasan Chisti. The shrine is next only to Mecca or Median for the Muslims of south Asia. Akbar used to make a pilgrimage to the Dargah from Agra once a year. Night stay in Pushkar. After breakfast and drive to Ranthambhore en-route visit Ajmer. The famous Dargah of Sufi Saint Hazrat Khwaja Moinuddin Hasan Chisti. The shrine is next only to Mecca or Median for the Muslims of south Asia. 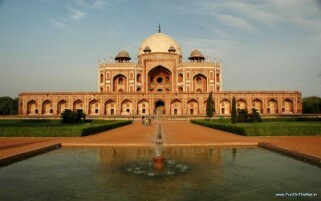 Akbar used to make a pilgrimage to the Dargah from Agra once a year. After visiting Continue drive to Ranthambhore . Arrive Ranthambhore and transfer to the hotel. Night stay in Ranthambhore. CHITTORGARH -Visit the magnificent 7th century Chittorgarh Fort. On way to the fort you can see two chhatris or memorials of Jaimal and Kalla marking the spots where they fell while defending the fort during the siege of 1568. Other attractions inside the fort include Vijay Stambh (Tower of Victory) and the Kirti Stambh (Tower of Fame). After visit continue drive to Bijaipur . Arrive Bijaipur and check-in at the hotel. Night stay in Bijaipur. Morning after breakfast proceed for sightseeing tour of Kumbhalgarh. 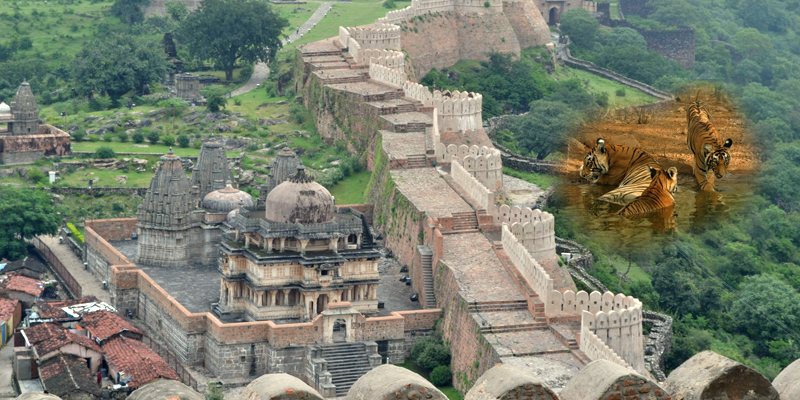 The Kumbhalgarh was built and ruled by Kumbha and his dynasty who was Sisodia rajputs descendents. Khumbhalgarh (Kumbhalmer) is a Mewar Fortress in Rajsamand district of Rajasthan state in western India. The Fort has perimeter walls that extend 36 kilometers in length, claimed to be the longest in the world after “The Great Wall of China”. Over 360 temples are within the fort. 300 ancient Jain and the rest Hindu. Later explore Kumbhalgarh Wildlife Sanctuary sprawling over 578 sq. 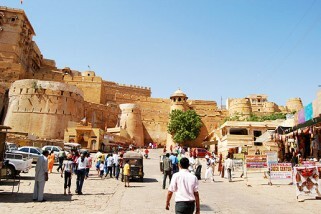 After sightseeing continue drive to Jodhpur. Arrive Jodhpur and check-in at the hotel. Night stay in Jodhpur. Morning after breakfast proceed for city sightseeing tour of Bikaner. Bikaner is named after its founder Rao Bika Ji in 1488. But long before this, the city was trade center on the caravan routes from Africa and West Asia. Bikaner's dominant features are rippling sands and abundant sunshine. The city stands on an elevation, enclosed by a 7 Kms wall, which can be entered from 5 gates. 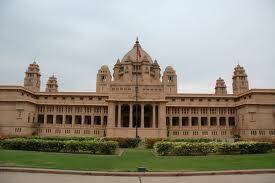 Bikaner City is bolstered by imposing walls and has a 16th century fort housing old palaces, temples and mosque. Founded by Raja Rai Singh the fort is distinguished by its long range of 37 pavilions, a line of balconies and aerial windows of varying designs. Also visit Lallgarh Palace, the museum, and Bhanda Sagar Jain and Deshnoke Rat temple. After sightseeing drive to Mandawa. Arrive Mandawa and check-in at the hotel. Night stay in Mandawa.